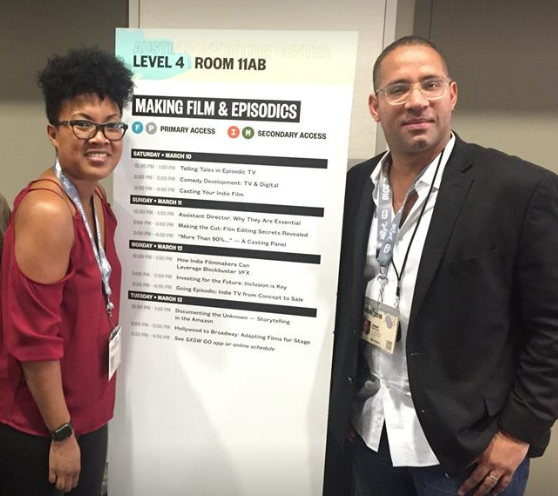 (L-R): Yvonne Huff Lee and Jason Delane Lee, the co-founders of the film finance and development company, The Lagralane Group, attend a panel at SXSW 2018. Using creative expression as a catalyst for change in the arts, especially on screen, is an essential element that any filmmaker must embrace in order to succeed. Leading audiences through the process of welcoming such revolutionary adjustments in the status quo is a vital element to The Lagralane Group. The corporation is a collection of artists, financiers and creative investors who strive to bring diverse and truthful storytelling to audiences through strategic film financing. The group was co-founded by actors, philanthropists and spouses, Jason Delane Lee and Yvonne Huff Lee, who aim to support uncommon voices, courageous visionaries and inspirational storytellers in their movies. The husband-and-wife team lead The Lagralane Group to highlight the exploration of honest, raw and uncompromising human experiences in their films. Their current movie projects include the Sundance Film Festival selections ‘Bisbee ’17,’ ‘Dark Money,’ ‘Inventing Tomorrow,’ ‘This Is Home,’ and ‘Won’t You Be My Neighbor?’ The company’s co-founders served as executive producers on the Oscar nominated documentary, ‘Icarus,’ as well. The Lees have also worked on the movies ‘Lucky’ and ‘Served Like a Girl,’ which both had their world premieres at SXSW. The Lagralane Group co-founders generously took the time the day after they participated in the panel, ‘Investing for the Future: Inclusion is Key,’ at this month’s SXSW to talk about their company during an exclusive interview at the InterContinental Stephen F Austin hotel. Among other things, the couple discussed their process of achieving their goal of elevating cultural consciousness through film. They also mentioned that they enjoy attending festivals like SXSW and Sundance, as they not only allow filmmakers to reunite with their former collaborators and celebrate their work, but also offers them opportunities to create new connections that help them achieve their latest goals. ShockYa (SY): Together you created The Lagralane Group. What inspired you both to launch the company, and what do your roles as co-founders of the group entail? Yvonne Huff Lee (YHL): Well, we’re both actors, and there came a point where we were trying to balance our careers with our family. Jason Delane Lee (JDL): We have three young kids, so as our family grew, we knew we had to change the game. YHL: A script came our way, which pushed us into wanting to form our own LLC. From there, we decided to start branding our company. So we found a bunch of actors who wanted to invest in the narrative space. JDL: With the script that Yvonne’s referring to, that project created the legal framework in 2014 that created the LLC, which has since become our company. So we’ve been calling ourselves a film finance and development company, both from the actor and legal perspectives.